Could you have done this episode without having a shower scene with an actual murder? Cuse: Had we not done a shower scene people would have been really pissed. It’s a little bit like if you go to see The Knack and they don’t play “My Sharona.” I know that’s a weird example. We felt like we had to do it, but we were also determined we were not going to make it be the same thing that was in the movie. Why the gender role reversal? Ehrin: We discussed this episode for a long time in the writers’ room. It was a tall order to bring Psycho in, not let it take over, and deliver a story that was going to have meaning for the arc of our characters. We also wanted our story to be at a peak while doing the episode, so it was almost like a math equation. 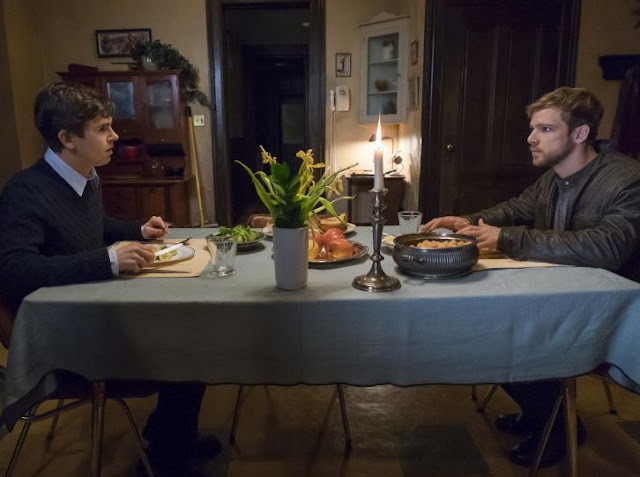 Eventually it felt like because the story we have been telling in Bates Motel is about how Norman got the way he is and how a lot of it had to do with growing up in a violent household, that led us back to killing Sam. The idea was that he represented to Norman a version of his father. Norman is really going deep, deep down the rabbit hole of insanity; this makes sense in his head at this moment. It’s both heartbreaking and horrific, which is sort of the cocktail that we like. We like heartbreak in our horror. IGN: Before I get to the all the blood that was spilled at the end of "Marion," can you talk about the decision to make Norma, the Norma side of Norman, go out and hook up with guys at a bar? Because it's a fascinating twist. Kerry Ehrin: The truth is that we don't know that he's only been hooking up with guys, but he certainly has been. Mother is a very different character than Norman. And Norman basically broke up with her at the end of this season's fourth episode. He basically said "This situation isn't working so well for me" and she was hurt. She was like "I've given up everything for this kid and he's treating me like s***" so she acted out. And she just went out and got drunk and had fun and hooked up with somebody. The decision very much came out of the character of Mother and how she would have acted in this situation. And also, it was always very delicious, this idea of Mother, who is not Norman -- it's very important to understand that -- of Mother being very present as this mother figure and this control figure for Norman but still also being a being of her own and who had a separate side and could go off and do whatever the f*** she wanted. A side that Norman didn't necessarily have to be aware of. That was always a really fun idea and we got to play with that a lot. IGN: Marion drives off in the end, with the cash, in search of a new life...but could she return by season's end? Cuse: No. And I don't think that's really a spoiler. We wrote this as the end for her. That she should really ride out into the night, in control of her own destiny, which we felt was the right evolution for this character.